Following a successful pilot earlier this year, project saT CHAT is returning to Stanley Picker Gallery’s Saturday programme on 6 and 13 June with two public events, including a special ‘Deep Chat’. saT CHAT systems are currently updating – please watch this space for further details. 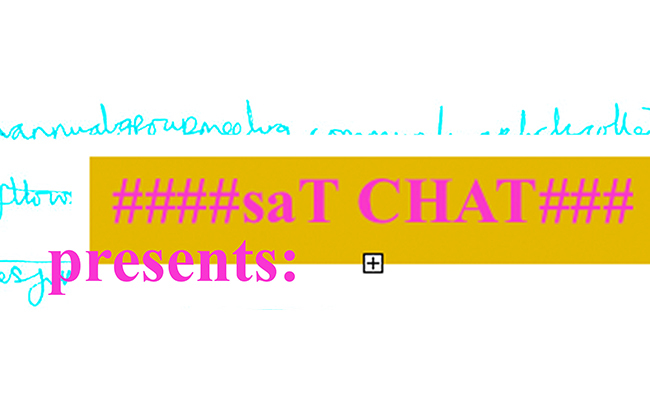 saT CHAT is a new initiative by Stanley Picker Gallery Saturday Staff Perry-James Sugden, Grant Bingham and Harriet Baggley which, embracing increasing digital cultures and web identities, aims to excite, attract and entice all to CHAT with the Gallery, both in person and online. Click here to read about previous saT CHAT activity.